Many mp3 player, smartphones and software music players use cover art to improve the identification of albums and songs. Album art also improves the manageability of the digital music collection, and many collectors see it as part of their music collection. Information about the active song are displayed at the top along with controls to play it and switch to another one stored in the folder. 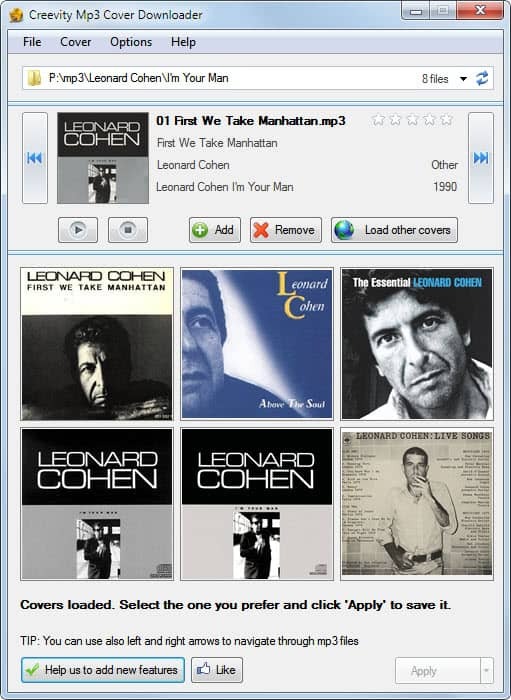 Mp3 Cover Downloader downloads six covers automatically from the Internet and displays them in its interface. A click on any of the covers and the selection of Apply adds the cover to the mp3 file that is currently displayed in the player. A prompt like the one shown on the screenshot below is displayed if a cover is already present in the mp3 file. A click on load downloads other covers from the web which can be useful if the first six covers are not suitable. This is handy if the six covers listed are not correct for the listed mp3 file. Left and right arrows on the keyboard, and left and right icons in the header are used to switch between mp3 files of the active folder. 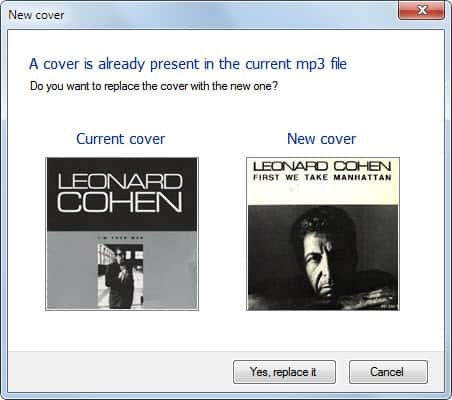 Mp3 Cover Downloader is a fast responsive program to add or change mp3 album covers. It unfortunately misses a feature to add a cover to all mp3 files of a folder which means that it takes longer than it should to add the same cover to all mp3 files of a folder. Mp3 Cover Downloader is available at the developer website over at Creevity. It tested without problems on a 64-bit Windows 7 Professional test system. Developers state that the application is compatible with all 32-bit and 64-bit editions of Windows from Windows XP on. I already use mp3tag, which has a decent cover downloader. Me too. Mp3tag is pretty nice. If I understand correctly, I will have to run the application x1000 on a folder that holds 1000 best of the 80’s mp3 files ? No, you run it once but have to flip through every single mp3 file that you want to add a cover to. This thing barely works!! It was okay for a little bit and next thing I know it crashes for 10 mins, and some of my songs became unreadable. Worst of all it slowed down my laptop, DON’T DOWNLOAD IT!! I never had issues running the program. Guess it would be a good idea to use a backup copy of your collection when you are using the program.